There is a movement afoot to increase the amount of positive recognition that takes place within organizations. While I fully support this effort, I believe we have to be careful about what it is that gets rewarded or recognized. The other day I was chatting with a few managers who were telling me that they had just launched a perfect attendance recognition program because they were having trouble getting people to show up for their shifts. They said it was typically when it was raining (the job is outside) or when the employees had to work late one night and be back early the next morning. Hmmm… So we’ve got some data, let’s look at that more closely. The question that has to be asked and answered is why. Why are they choosing to call out when it’s raining? My guess is that they know the job still needs to be done, so we can rule out that they don’t think there would be anything to do. Maybe they don’t understand how important their job is (even in the rain) and feel that it’s not worth it to them to endure some slightly adverse conditions to do that job. Maybe as a leadership team we haven’t explained (or better yet, shown) them how valuable they are and what an impact it is to the team and the company when they are not there. If this is the case, is a perfect attendance reward going to change this behavior? Likely not, but you might just get exactly what you are rewarding for: people showing up just to show up, bringing their poor attitude with them. The other issue mentioned was the working-late-coming-in-early scenario. We’ve all been there from time to time. But if an employee doesn’t see the value they bring, they certainly won’t go out of their way to help when asked. So we go back to the question of why. Why do we need to be scheduling people for late shifts and early shifts back-to-back (especially if it’s a consistent thing)? Are we short staffed? Do we not have enough people with the right availability? Are either of these situations solved with an incentive program? I’ll let you answer that. Similarly, we need to be rewarding for the right things. You want great guest service? Recognize that. You want high productivity? Recognize that. Be specific and explicit about what you are looking for, and the reasons behind why you are looking for it. Then you’ll be happy to get the behavior you are rewarding for. Until next time – stay optimistic! I’ve got exciting news I’d like to share! In the next few weeks, I will embarking on a new chapter of my professional life. After 8 years at Universal Orlando, I will be scaling way back on my responsibilities with them so I can pursue a few cool opportunities. First, my wife and I started Stamping School (www.stampingschool.com – a resource for the crafting industry) in 2007 as a very part time enterprise. We are finally at a point where we can rebuild the site and make it one of our full time businesses. We hope to launch the new site in a few months, and then plan to take the show “on the road” hosting events all over the country. Not being able to stay away from the amusement industry and training, I will still be working with IAAPA and will also be building up my own independent training/consulting business. I’ve dabbled here and there to this point, but now is the time to really make a go of it. I’ve worked with a number of you in the past, and any referrals would be kindly appreciated! Lastly, I will also partnering with Scot Carson at Amusement Advantage to provide additional support and resources to the clients that use his secret shopping service. It’s exciting to venture out away from the safety net of a large company. If you would have told me I would be doing this 10 years ago, I would have said no way. Today was one of my first days working from home, and I have to say I really like it. Just the time I save without having to commute is enough to sell me on the idea – not that it’s a hard sell! I really want to thank you all for continuing to read and connect and let me be a part of your world. It’s an honor! Until we get to chat – stay optimistic! In part one of this journey, it was all about telling a story. Part 2 continued with a tale about adding great value. Now in part 3, I finally get to tell you about being honest. Here we go. Our first stop in Alaska was in Ketchikan, the self-proclaimed salmon capital of the world. I have no reason to dispute this, so I won’t. I was surprised, pleasantly, by his answer. He simply said, “I want to sell you something”. Ultimately, I didn’t buy anything from him. However, if I am ever in Ketchikan again, I will certainly look him up. If you are ever there, you can, too! Are you this honest with your employees or guests? One term that gets a lot of play right now is the word ‘transparency’. In other words, being open and honest in a way that shows your flaws as much as your strengths. That can be tough for some people to do, but it shows you are human, and that helps people relate to you. One specific area this has surfaced is in social media… a dissatisfied customer posts to your Facebook page and you want to take it down. Resist that urge. No one is perfect, so don’t try to pretend that you are. Often, other loyal followers will come to your defense without you having to get involved. If you do need to step in, do so in a professional manner and let your other customers see just how seriously you take their concerns. Back in part one of this series, I mentioned how important it was to tell, or be part of, a story. This has a greater impact on your ability to connect with your customers than simply spouting facts and figures. This time around I wanted to tackle the second lesson I learned while in Alaska – Give Great Value! (Number 3 is to Be Honest, and that will be covered in part 3 of the series). When Linda and I heard that we would be traveling near the Chilkat Eagle Preserve in Alaska, we quickly set out to book a tour in the area. A little Google-izing connected us to Captain Dave. Thank you, Google! Captain Dave’s website boasts a slow float tour of the Chilkat Valley, with plenty of opportunities to see Bald Eagles in their natural habitat. We signed up, and got excited. When we met Dave on the day of the tour, he informed us that there hasn’t been enough run-off from the glaciers yet this year and the water level in the valley was too low. There were very few fish, which meant very few eagles. Not to worry, though, Captain Dave had a Plan B.
Dave took us by boat to Dyea, which wasn’t all that far from the cruise ship terminals when counted by miles, but it was worlds away in terms of scenery and wildlife fun. We saw eagles and seals and enjoyed Dave’s narration of local history and lore. It was a GREAT tour, even if it wasn’t exactly what we signed up for. Really? You are giving us your van for the day? How cool! 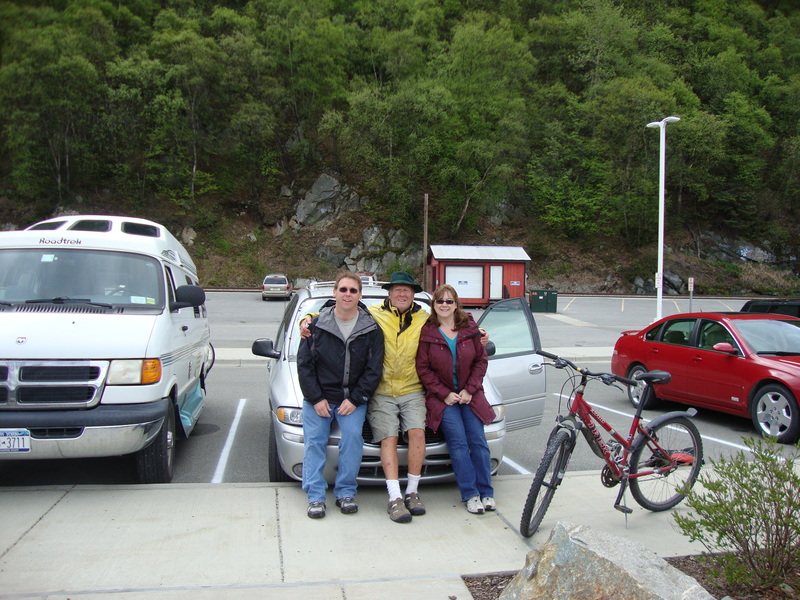 So, we did exactly what Dave told us to do… we explored Skagway. Had to be one of the best days we had in Alaska! We ended up picking up some friends who happened to be walking through town, and they couldn’t believe we had a van for the day. Neither could we! Many of the things we got to do later that day were a direct result of Dave’s kindness. Click here to read more about that if you’d like. So here’s the real question… what sort of value do you add or provide to your customers, even when they aren’t expecting it? Captain Dave’s boat tour was better than expected, and the use of his van was over the top! You might imagine that more than just gas money was left in the van when we dropped it off. All of our friends pitched in to provide a healthy tip. A direct example of how kindness and adding value adds to your bottom line. PS – Even before the van offer, Linda and I were so impressed by Dave’s tour that we wanted to help him build his business. We shot this quick video of him that he can now use on his website. It was free to him, and we were glad to do it! Coming soon – part 3: Be honest.